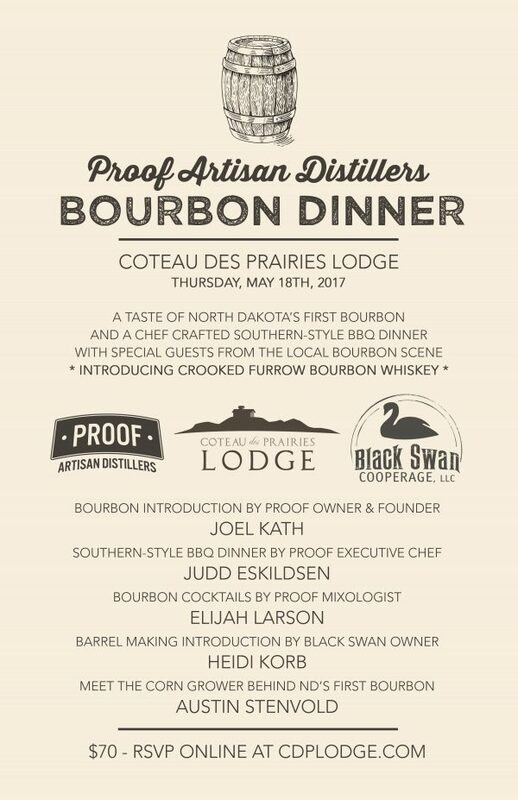 To celebrate North Dakota’s first bourbon whiskey, we are hosting a bourbon dinner on Thursday, May 18th. 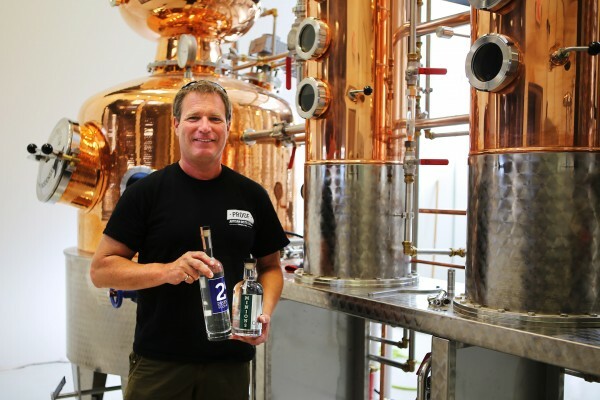 Proof Artisan Distillers opened in downtown Fargo in 2015 with two spirits – 2 Docks Vodka and Minions Gin. That was also the year we hauled the first load of corn from the Austin and Olivia Stenvold farm to the distillery where it would begin the long process of becoming a bourbon whiskey. Aged nearly two years in charred oak barrels made by Black Swan Cooperage near Park Rapids, MN, the bourbon is almost ready for the big time. Our bourbon dinner guests will be the first to taste the new bourbon. Crooked Furrow Bourbon Whiskey by Proof Artisan Distillers will be served in cocktails crafted by Proof Mixologist Elijah Larson along with a southern-style BBQ dinner prepared by Proof Executive Chef Judd Eskildsen. Guests will hear from the people behind North Dakota’s first bourbon. Joel Kath, owner and founder of Proof, will introduce his new bourbon and talk about the fascinating process of turning corn into bourbon. Heidi Korb, owner of Black Swan Cooperage, will be showing off her barrels and talking about the coopering process. Austin Stenvold, local farmer providing corn to Proof and founding member of Coteau des Prairies Lodge, will be talking about growing and processing corn for making bourbon. Proof Artisan Distillers opened in 2015. 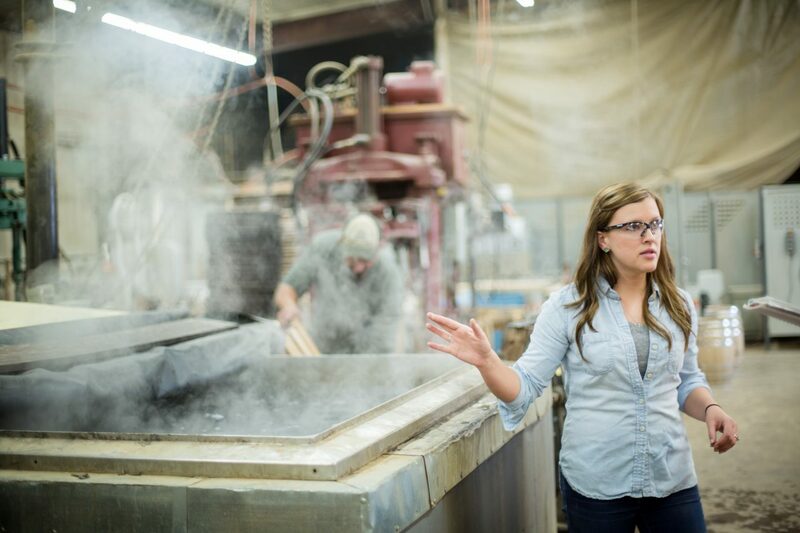 Located in historic downtown Fargo, ND, Proof produces top self quality vodka, gin, whiskey, bourbon and liqueurs from local products: potatoes, barley and corn. Proof offers an incredible distillery destination opportunity where guests experience locally produced and nationally awarded spirits, handcrafted award-winning cocktails, along with impeccable dining. Black Swan owner Heidi Korb gives tour at coopering facility. Black Swan started in 2009 as a 2 person father/daughter barrel-making team in a 3000 sq. ft. quonset building near Long Prairie, MN. They are now in a 10,000 sq. ft. building, with 13 employees in Park Rapids, MN. Black Swan manufactures whiskey barrels and barrel alternatives for the craft distilling and brewing industry nationwide. They serve several customers in the region such as Proof Artisan Distillers, Surly Brewing, Far North Spirits, etc. The event is Thursday, May 18th at Coteau des Prairies Lodge. Space is limited and available by reservation only. The price is $70 per person. The price includes a chef crafted dinner and three craft cocktails. Water and coffee will be provided. Sodas and additional alcoholic beverages will be sold at the bar. Doors open at 4pm, guests are welcome to come early, tour the lodge and enjoy refreshments served at the bar. Cocktail hour begins at 6pm. Trust us, you don’t want to miss cocktail hour. Because we have limited space available, we kindly request advanced notice if you must cancel your reservation or reduce your party size so we can make room for other guests. Thank you. You will receive confirmation of your reservation within 24 hours. According to Chef Judd Eskildsen, this is how we know Crooked Furrow by Proof is the first legal North Dakota bourbon whiskey. In 1890, when North Dakota became a state, citizens voted to be a dry state in an attempt to drive out the Germans (who loved their beer). There may have been whiskey produced in ‘Dakota Territory’, but there are no known records of it. The State of North Dakota didn’t have legally produced beer, wine or liquor until the repeal of prohibition in 1933. It is said that this whole area was frequented by Al Capone and other bootleggers during prohibition, so it is likely distilled products came out of North Dakota during that time, but they obviously were not legal. No known distilleries have produced a legal bourbon whiskey or any whiskey since that time. For a whiskey to be called a bourbon, its mash, the mixture of grains from which the product is distilled, must contain at least 51% corn and the distillate must be aged in a new charred oak barrel. So there you have it. Crooked Furrow is the first North Dakotan bourbon whiskey!